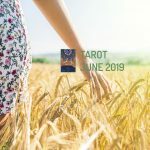 In Tarot for June 2019, The Moon is the arcana that dictates what will happen, which indicates that you can be objective when interpreting reality, including when using your intuition. The Moon is a heavenly body that has fascinated men at night since the beginning of time. Part of its mystery, similarly to the fear it causes in certain people and cultures, is related to its constant change, as it goes through different phases during its cycle. Thus the Gibbous, New Moon, Crescent and Full Moon have given rise to numerous myths and legends over the millennia. In Tarot for June 2019, The Moon is the arcana that dictates the month, and we should not think about it just as the queen of the night, the mistress of darkness, but we can also look at it differently than this interpretation which is somewhat negative and see it as the light that illuminates the darkness, the beacon which we can follow to get to know the interior of our soul. In the card, the Moon appears suspended in the middle of the night, with its rays shining, illuminating the darkness. There are two dogs underneath her barking up at her, they do not want to lose their territory, since the Moon can throw them out, although they are not able to face her either. There are also interpretations that say that there are wolves that howl under the mythical body. Behind them there are two towers, one on each side, which guide us to the unconscious world, to the depths of our soul. In front of the dogs there is a lake which symbolizes mystery. There is a crab inside of it. It wants to show us the duality of courage and fear. Courage to face a problem but later fear to continue, that is why it is moving backwards. This card tells us that we are going through a period of confusion that we want to leave but that we are afraid to do so. Fear trumps courage. That is why we must move beyond the past in order to face the future. Problems can only be solved by facing them. And the only way to overcome fear is by cultivating courage. We must analyze reality in the most objective way possible, although we can also rely on our intuition, without necessarily creating a contradiction. Regarding work, the opportunities that will arise will be related to jobs where you work at night (late night shifts such as nurses, doctors, factory workers, night clubs) or jobs related to the world of children (nurses, midwives, nannies). Regarding the sentimental world, relationships may come up that have to be kept secret. This will provoke excitement but also a tension for being discovered. The money generated in the night world will come and go constantly, while, with respect to health, there may be pregnancies, uterus and ovary problems or even depression.